Customers often use public endpoints to perform cross-region replication or other application layer communication to remote regions. But a common problem is how do you protect these endpoints? It can be tempting to open up the security groups to the world due to the complexity of keeping security groups in sync across regions with a dynamically changing infrastructure. Consider a situation where you are running large clusters of instances in different regions that all require internode connectivity. One approach would be to use a VPN tunnel between regions to provide a secure tunnel over which to send your traffic. A good example of this is the Transit VPC Solution, which is a published AWS solution to help customers quickly get up and running. However, this adds additional cost and complexity to your solution due to the newly required additional infrastructure. Another approach, which I’ll explore in this post, is to restrict access to the nodes by whitelisting the public IP addresses of your hosts in the opposite region. Today, I’ll outline a solution that allows for cross-region security group updates, can handle remote region failures, and supports external actions such as manually terminating instances or adding instances to an existing Auto Scaling group. The overview of this solution is diagrammed below. Although this post covers limiting access to your instances, you should still implement encryption to protect your data in transit. If your entire infrastructure is running in a single region, you can reference a security group as the source, allowing your IP addresses to change without any updates required. However, if you’re going across the public internet between regions to perform things like application-level traffic or cross-region replication, this is no longer an option. Security groups are regional. When you go across regions it can be tempting to drop security to enable this communication. Although using an Elastic IP address can provide you with a static IP address that you can define as a source for your security groups, this may not always be feasible, especially when automatic scaling is desired. In this example scenario, you have a distributed database that requires full internode communication for replication. If you place a cluster in us-east-1 and us-west-2, you must provide a secure method of communication between the two. Because the database uses cloud best practices, you can add or remove nodes as the load varies. To start the process of updating your security groups, you must know when an instance has come online to trigger your workflow. Auto Scaling groups have the concept of lifecycle hooks that enable you to perform custom actions as the group launches or terminates instances. When Auto Scaling begins to launch or terminate an instance, it puts the instance into a wait state (Pending:Wait or Terminating:Wait). The instance remains in this state while you perform your various actions until either you tell Auto Scaling to Continue, Abandon, or the timeout period ends. A lifecycle hook can trigger a CloudWatch event, publish to an Amazon SNS topic, or send to an Amazon SQS queue. For this example, you use CloudWatch Events to trigger an AWS Lambda function that updates an Amazon DynamoDB table. 1. Determines whether a change was triggered by your Auto Scaling group lifecycle hook or manually invoked for a “true up” functionality, which I discuss later in this post. 2. Describes the instances in the Auto Scaling group and obtain public IP addresses for each instance. 3. Updates both local and remote DynamoDB tables. 4. Compares the list of public IP addresses for both local and remote clusters with what’s already in the local region security group. Update the security group. 6. Signals CONTINUE back to the lifecycle hook. You use DynamoDB to store lists of remote IP addresses in a local table that is updated by the opposite region as a failsafe source of truth. Although you can describe your Auto Scaling group for the local region, you must maintain a list of IP addresses for the remote region. To minimize the number of describe calls and prevent an issue in the remote region from blocking your local scaling actions, we keep a list of the remote IP addresses in a local DynamoDB table. Each Lambda function in each region is responsible for updating the public IP addresses of its Auto Scaling group for both the local and remote tables. As with all the infrastructure in this solution, there is a DynamoDB table in both regions that mirror each other. For example, the following screenshot shows a sample DynamoDB table. The Lambda function in us-east-1 would update the DynamoDB entry for us-east-1 in both tables in both regions. By updating a DynamoDB table in both regions, it allows the local region to gracefully handle issues with the remote region, which would otherwise prevent your ability to scale locally. If the remote region becomes inaccessible, you have a copy of the latest configuration from the table that you can use to continue to sync with your security groups. When the remote region comes back online, it pushes its updated public IP addresses to the DynamoDB table. The security group is updated to reflect the current status by the remote Lambda function. Note: All of the following steps are performed in both regions. The Launch Stack buttons will default to the us-east-1 region. 1. An instance is launched or terminated, which triggers an Auto Scaling group lifecycle hook, triggering the Lambda function via CloudWatch Events. 2. The Lambda function retrieves the list of public IP addresses for all instances in the local region Auto Scaling group. 3. 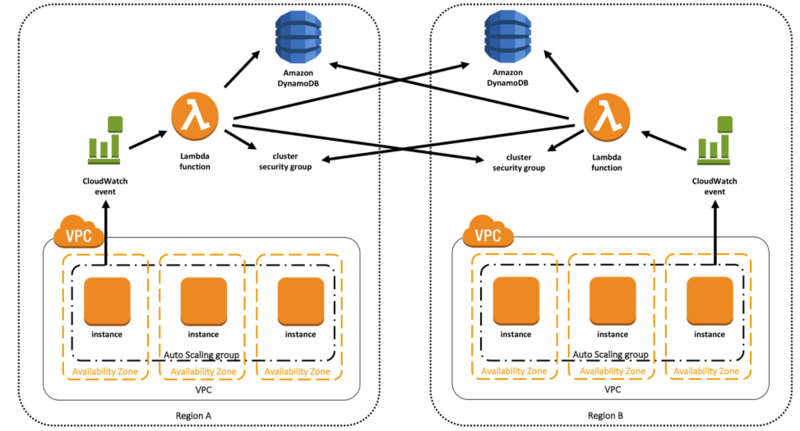 The Lambda function updates the local and remote region DynamoDB tables with the public IP addresses just received for the local Auto Scaling group. 4. The Lambda function updates the local region security group with the public IP addresses, removing and adding to ensure that it mirrors what is present for the local and remote Auto Scaling groups. 5. The Lambda function updates the remote region security group with the public IP addresses, removing and adding to ensure that it mirrors what is present for the local and remote Auto Scaling groups. To deploy this solution, you need to have Auto Scaling groups, launch configurations, and a base security group in both regions. To expedite this process, this CloudFormation template can be launched in both regions. Download the template from here or click to launch. Upon launching the template, you’ll be presented with a list of parameters which includes the remote/local names for your Auto Scaling Groups, AWS region, Security Group IDs, DynamoDB table names, as well as where the code for the Lambda function is located. Because this is the first region you’re launching the stack in, fill out all the parameters except for the RemoteTable parameter as it hasn’t been created yet (you fill this in later). After the stack has finished launching, you can test the local region. Open the EC2 console and find the Auto Scaling group that was created when launching the prerequisite stack. Change the desired number of instances from 0 to 1. For both regions, check your security group to verify that the public IP address of the instance created is now in the security group. Now, change the desired number of instances for your group back to 0 and verify that the rules are properly removed. When you deploy a Lambda function using CloudFormation, the Lambda zip file needs to reside in the same region you are launching the template. Once you choose your remote region, create an Amazon S3 bucket and upload the Lambda zip file there. Next, go to the remote region and launch the same SAM template as before, but make sure you update the CodeBucket and CodeKey parameters. Also, because this is the second launch, you now have all the values and can fill out all the parameters, specifically the RemoteTable value. When you originally launched the template in the local region, you didn’t have the name of the DynamoDB table for the remote region, because you hadn’t created it yet. Now that you have launched the remote template, you can perform a CloudFormation stack update on the initial SAM template. This populates the remote DynamoDB table name into the initial Lambda function’s environment variables. In the CloudFormation console in the initial region, select the stack. Under Actions, choose Update Stack, and select the SAM template used for both regions. Under Parameters, populate the remote DynamoDB table name, as shown below. Choose Next and let the stack update complete. This updates your Lambda function and completes the setup process. You now have everything fully configured and in place to trigger security group changes based on instances being added or removed to your Auto Scaling groups in both regions. Test this by changing the desired capacity of your group in both regions. If an instance is manually added or removed from the Auto Scaling group, the lifecycle hooks don’t get triggered. To account for this, the Lambda function supports a “true up” functionality in which the function can be manually invoked. If you paste in the following JSON text for your test event, it kicks off the entire workflow. For added peace of mind, you can also have this function fire via a CloudWatch event with a CRON expression for nearly continuous checking. 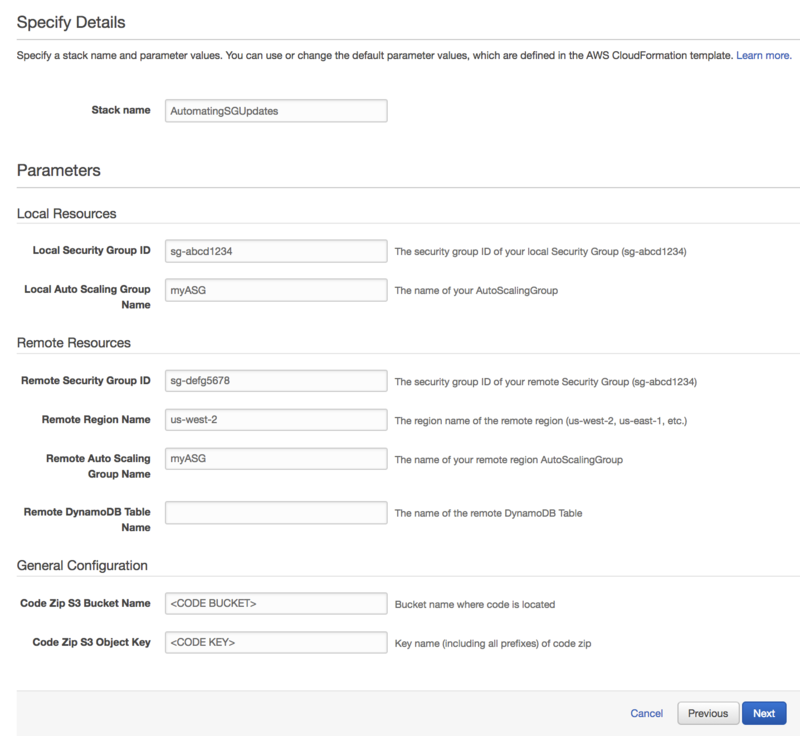 Now that all the resources are created in both regions, go back and break down the policy to incorporate resource-level permissions for specific security groups, Auto Scaling groups, and the DynamoDB tables. Although this post is centered around using public IP addresses for your instances, you could instead use a VPN between regions. In this case, you would still be able to use this solution to scope down the security groups to the cluster instances. However, the code would need to be modified to support private IP addresses. At this point, you now have a mechanism in place that captures when a new instance is added to or removed from your cluster and updates the security groups in both regions. This ensures that you are locking down your infrastructure securely by allowing access only to other cluster members. Keep in mind that this architecture (lifecycle hooks, CloudWatch event, Lambda function, and DynamoDB table) requires that the infrastructure to be deployed in both regions, to have synchronization going both ways. Because this Lambda function is modifying security group rules, it’s important to have an audit log of what has been modified and who is modifying them. The out-of-the-box function provides logs in CloudWatch for what IP addresses are being added and removed for which ports. As these are all API calls being made, they are logged in CloudTrail and can be traced back to the IAM role that you created for your lifecycle hooks. This can provide historical data that can be used for troubleshooting or auditing purposes. Security is paramount at AWS. We want to ensure that customers are protecting access to their resources. 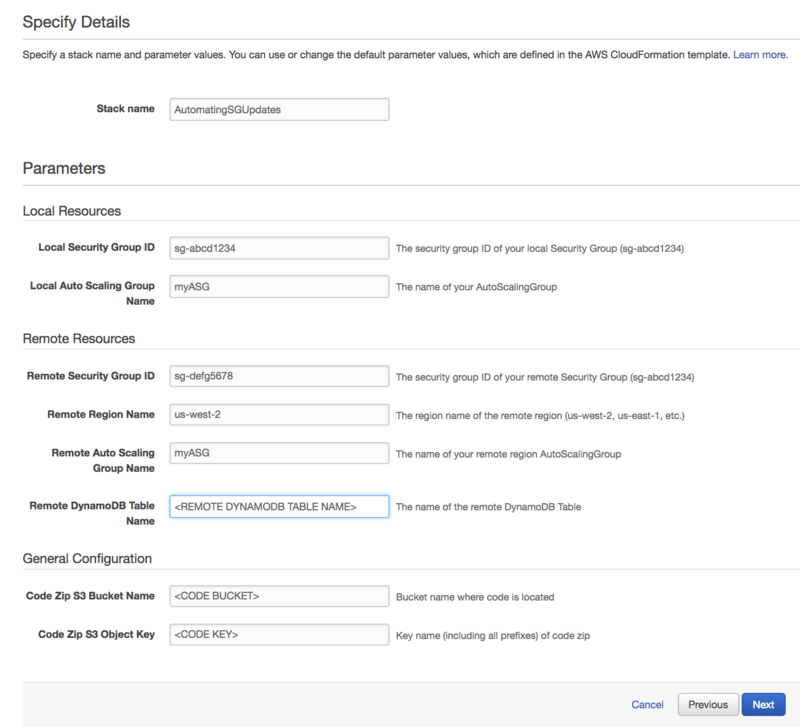 This solution helps you keep your security groups in both regions automatically in sync with your Auto Scaling group resources. Let us know if you have any questions or other solutions you’ve come up with!